PTR Baler and Compactor Company prides itself on quality, performance and durability. Each unit is water tested and factory inspected to insure year after year of dependable use, and every unit is backed with our best-in-class PTR warranty. 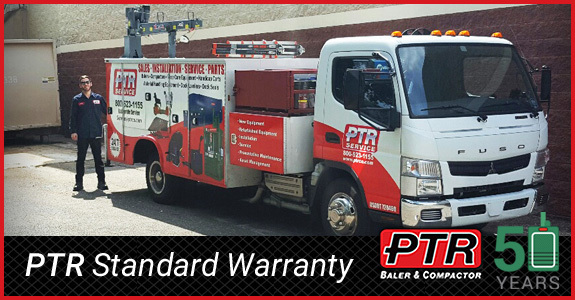 PTR’s standard warranty covers all equipment when operated, maintained and installed, and used in normal service for one full year from the date of installation, to be free from defects in both material and workmanship. What’s more, in addition to the 1 full year warranty, we will continue to warrant the following parts for defective operation for an additional 2 years. Adjustments required as the result of routine operations; limit switches, pressure switch, relief valve. Tightening of hydraulic fittings and terminal connections. Ejector system chains, straps or shackles. Repairs necessitated by improper use, failure to follow instructions and abuse of equipment. Your authorized PTR service center is required to use PTR Baler & Compactor Company authorized parts only.